Exempla Healthcare was planning the opening of The Heart Center at their Lutheran Medical Center facility. In keeping with their goal to make the new heart center a one-of-a-kind facility and a true asset to the community, Exempla was seeking an interactive system that would offer visitors access to The Heart Center’s educational video library. The VisMed Educator patient education delivery system was the perfect solution for Exempla’s new Heart Center. 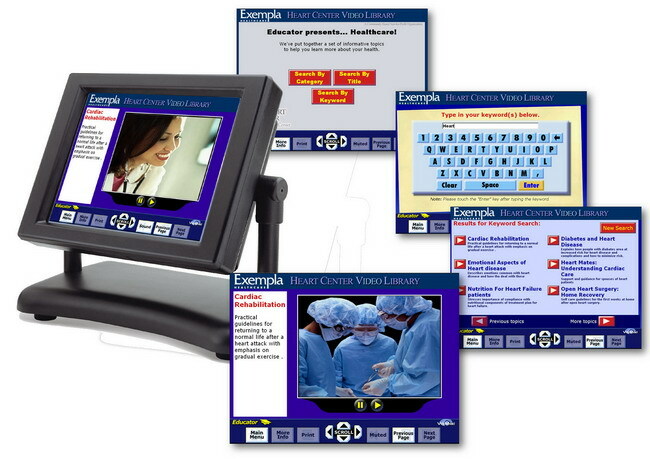 VisMed educator provides Exempla’s patients and visitors with an easy to use touch screen interface that allows the user to search the video library by content category, by video title or enter in a keyword search. Once a video is selected the user can watch the video with on-screen controls that allow them to adjust the sound volume, pause the video or quickly switch to a new video. The Heart Center will host two VisMed Educator systems. One installed in a in-wall unit at the entrance to the Heart Center and the second is a portable system (pictured above) that will be used in a variety of locations throughout the hospital. The new Heart Center now offers a full range of cardiology services to patients in one location. It features two cardiac catherization labs, an electophysiology lab, pre-and post-operative care, a cardiac rehabilitation unit, a testing center and pulmonary functions lab. The Heart Center incorporates the latest technology in a facility that is designed to cater to the comfort and convenience of patients.